HomeGastric BypassWhat Are Some Weight Loss Surgery Options? Are you like Melissa, a shell of a human who has virtually given up? If so, then you might want to keep reading. What Do I Mean By Weight Loss Surgery Options? This procedure reduces the size of the stomach by creating a small pouch with sutures and stitches, and then connects that pouch to the small intestines. It is fairly common; in 2005 over 140,000 of these surgeries were done. It can be done laparoscopically (small, less invasive incisions) or through an open incision. Here the surgeon will laparoscopically apply a small silicone ring (Band) around the upper part of the stomach which creates a smaller area for nutrient absorption and weight loss ensues. It is one of the most popular surgeries being used today and it is fairly safe. Warning the following video shows graphic scenes of a Gastric Lap-Band Surgery. This surgery is more serious as it requires an open incision and is permanent without the possibility for reversal. The surgeon will actually remove about 85% of the stomach and sew it together so that it looks tubular or “sleeve-like”. It is then sown to the small intestines. In this complicated and less frequently performed surgery, a large part of the stomach is resected (cut out.) Then the surgeon will bypass the duodenum and jejunum (upper part of the small intestine) and connect the pouch to the lower small intestine. It is good in that, there are much less dietary restrictions with this surgery, but can have more surgical complications. These are the four main types of Weight Loss Surgery Options. 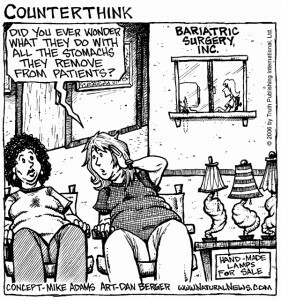 If you decide to have surgery, you’ll have to consult with your physician, who will refer you to a Bariatric Surgeon. Together you and your surgeon will decide which option is right for you. What Are Some Concerns When Using Weight Loss Surgery Options? There are several things to consider BEFROE you have Bariatric Surgery. You have to realize that this is not a “No Muss, No Fuss” weight loss miracle. This is going to require commitment and hard work for an extended period of time. Not to mention a complete life style change. Depression is rarely discussed with pre-operative patients, but as almost 70% of patients say they deal with it, perhaps it should be a major consideration. Weight Loss Surgery Options often lead to dramatic weight loss, but not without a cost. Depression is listed above as a medical concern, because often a patient’s post-operative life is drastically different from their pre-operative. Food can no longer be “used” to feel better. Exercise and activity will be required in order to facilitate the weight loss. Be prepared to change everything about your lifestyle and you’ll do fine. Warning: The following video contains a discussion about sexual changes in WLS patients lives. AS you can see this is a big commitment and something you can’t “half do”. Find out every aspect of the Weight Loss Surgery Options before you make such a huge financial expenditure. Are the Weight Loss Surgery Options Worth the Risks? I say yes. Now obviously, that’s a decision each person will have to make for themselves. Do your homework, find out all the Weight Loss Surgery Information you need to, see if you have Weight Loss Surgery Insurance. and make a decision. If you have the means, and a burning desire to change your life with Weight Loss Surgery Options, then take a chance. Match the Surgeries to their appropriate descriptions below, and check yourself with the answers at the bottom of the page! a. This procedure reduces the size of the stomach by creating a small pouch with sutures and stitches, and then connects that pouch to the small intestines. It is fairly common; in 2005 over 140,000 of these surgeries were done. It can be done laparoscopically (small, less invasive incisions) or through an open incision. b. Here the surgeon will laparoscopically apply a small silicone ring (Band) around the upper part of the stomach which creates a smaller area for nutrient absorption and weight loss ensues. It is one of the most popular surgeries being used today and it is fairly safe. c. This surgery is more serious as it requires an open incision and is permanent without the possibility for reversal. The surgeon will actually remove about 85% of the stomach and sew it together so that it looks tubular or “sleeve-like”. It is then sown to the small intestines. d. In this complicated and less frequently performed surgery, a large part of the stomach is resected (cut out.) Then the surgeon will bypass the duodenum and jejunum (upper part of the small intestine) and connect the pouch to the lower small intestine. It is good in that, there are much less dietary restrictions with this surgery, but can have more surgical complications. Should I Have Weight Loss Surgery? Gastric Sleeve Surgery Is there a Gastric Bypass Diet? What is Gastric Bypass Surgery? That comic with the stomach lamps is gross. lol Seriously though, there are so many dangers associated with this type of invasive surgery I can’t imagine it’s an easy decision to make. Bariatric surgery is so expensive, but thanks for covering what all you have to pay for. It’s nice to have information about all the different types without it being a come-on for a doctor’s office or something. Thanks. I’m glad you put out the psychological issues when it comes to food and overeating. My friend who had gastric bypass struggles with the urge to eat for comfort still. Luckily her procedure included counseling and lifestyle help. Great article! 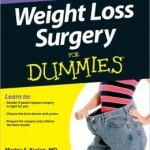 Weight loss surgery may not be for everyone, and for sure is not an option I would consider. However, for habitual over eaters who, like any addict, can not beat the craving it’s probably the only solution. It’s much like the alcoholic who has to take Antabuse to become violently ill when consuming alcohol. Radical, but when all else fails you turn to the least attractive of options to get the desired result.